WAFABCO | Tunnels O' Fun! Jumping Beans! : Kids love watching the movement of the beans as they jump. Wapello Inflatable Playspaces are easy put-up and quick to take-down. "On your mark, Get set, Go! " Tunnels O' Fun, a Wapello original, is designed for kids of all ages. 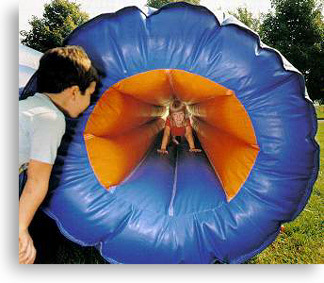 It is great for fund raising events, parks, obstacle courses, or whatever uses you can imagine. It's guaranteed for laughs and excitement. It is made of colorful, heavy-duty vinyl and is backed by our dedicated service/repair team. Complete with blower, this amusement, like all Wapello products, can be built to your preferred specifications. Tunnels O' Fun is the perfect addition to your amusement line. Copyright © 1996-2013, Wapello Fabrications Co., Inc. | WAFABCO . P.O. Box 126, 210 N. Second St. Valid XHTML & CSS. This site is Section 508 compliant.